Finely woven white linen and vividly colored textiles, even gold threads, have been part of our worship tradition for a very long time. Although you may not be interested in setting up a big floor loom and threading it with dozens of linen threads per inch, there is no reason why you can’t enjoy experimenting with weaving for the altar. The vast array of textures and colors being produced for the resurgence of knitting can also fuel our imaginations for vestment design. 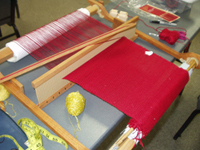 A simple rigid heddle loom is a modest investment that can bring years of enjoyment. Learning to use it is not much more complicated than the loop pot holders we all remember from childhood. Brand new weavers at the Kanuga Liturgical Arts Conference set up their looms, weave a stole length and construct the stole all during the five day conference. The results are amazing in imagination and variety. Here are some things to keep in mind when choosing interesting yarns from the knitting shop for liturgical weaving. Make sure each strand will pass through the openings on the rigid heddle. Avoid fuzzy and furry yarn that will get stuck in the heddle. Test for strength for the tension needed on the loom. If you can easily break the yarn with your hands, it may not be strong enough for the warp (the threads that are wound on the loom), but could be used in the weft (the yarn that is woven over and under the warp threads). Novelty yarns can be used in the warp and or the weft, but it is best to use just a few. Two or three yarns with contrasting color or texture will show up best if they are woven with a background of plain texture and seasonal liturgical color. Too much variety in one piece confuses the eye. 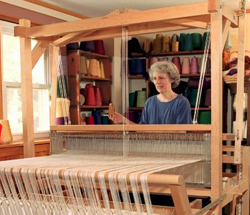 A rigid heddle loom can be easily moved from room to room or off to the summer cottage. You will find that weaving is a relaxing exercise and something that you can enjoy for a few minutes or hours at a time. It takes less than two yards to make a stole or orphreys for a chasuble and hangings. When it is time to take the fabric off the loom, gather your friends around to see the birth of your unique textile. 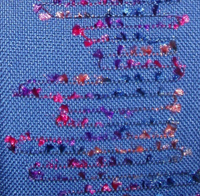 Use a fusible interfacing to stabilize your hand woven fabric. Be sure to serge the edges of the pieces you cut for stole or orphreys to prevent the edges from fraying. Using hand woven fabric to accent vestments made with commercial yardage creates economical, long lasting pieces that will be treasured by any parish.